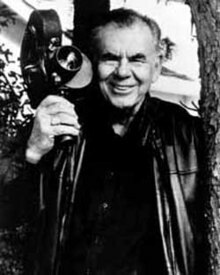 Russell Albion "Russ" Meyer (March 21, 1922 – September 18, 2004) was an American movie director, producer, screenwriter, cinematographer, editor, actor and photographer. Meyer is known writing and directing on a series of successful low-budget sexploitation movies that featured campy humor, sly satire and large-breasted women such as in Faster, Pussycat! Kill! Kill!. During his early movie career, Meyer used to work with future Pulitzer Prize-winning movie critic Roger Ebert. Meyer was born on March 21, 1922 in San Leandro, California to a German-American family. He was raised in Oakland, California. He was married to Betty Valdovinos from 1949 until they divorced in 1950. Then he was married to Eve Meyer from 1952 until they divorced in 1966. Then he was married to Edy Williams from 1970 until they divorced in 1973. Meyer died on September 18, 2004 in Hollywood Hills, Los Angeles, California from complications from pneumonia after battling Alzheimer's disease. He was 82 years old. Meyer was buried at Stockton Rural Cemetery in Stockton, California. Fox Searchlight Pictures is currently negotiating the rights to create a biopic covering the early years of Meyer's career. ↑ "Russ Meyer, 82, a Filmmaker of Classics in a Lusty Genre, Dies". The New York Times. September 23, 2004. Retrieved August 11, 2013. ↑ "Weekly Ketchup: Jennifer Lawrence Cast in The Hunger Games". Flixster, Inc. October 1, 2011. Retrieved August 11, 2013. Wikimedia Commons has media related to Russ Meyer.